Today Facebook moved from displaying live streams of friend updates to “news” by default. There’s more to this than meets the eye at first. What’s actually happened is Facebook has placed recommendations front and center on the third most popular site on the web. One of the things that first got us excited about the recommendations space was seeing the merging of the social graph and traditional recommendations applications on the horizon. Friend finders and the like are the most obvious (and boring) applications of recommendations applied to the social graph, but the potential goes far beyond that. Information overload has always been the driver of major innovation on the web. Social applications and information overload have been on a crash course for a while. The intersection where they collide says much about the shape of things to come. In these days where followers / friends / fans are quickly outpacing the ability for one to consume the “real time stream” as such, recommendations will be the way forward. So, let’s step back a little bit and talk about recommendations. I wrote an introduction to recommendations a while back that talked some about traditional recommendations based on things like purchase histories, ratings and whatnot and compared that to graph-based recommendations. In the graph-based example I mentioned the possibility of using friends within a social network to drive the recommendations. The thing is that these data sets need not be separate. The social graph isn’t just friends; it’s a broad model for interactions between people and content on the web — there’s no reason not to consider products and news articles as elements of the social graph, and once they’re in that grand unified model of interaction on the web to harvest that data to figure out what people are likely to be interested in. But that’s not just possible — it’s absolutely necessary. Recommendations present pretty much the only way forward for handling the explosion of real-time data on the web. Now instead of showing every update by default — Facebook is picking the things you’re likely to be interested in based on feedback from your friends: recommendations, essentially. Information overload has always been the driver of major innovation on the web. Social applications and information overload have been on a crash course for a while. The intersection where they collide says much about the shape of things to come. In these days where followers / friends / fans are quickly outpacing the ability for one to consume the “real time stream” as such, it’s interesting to think of how you get out of that conundrum. What you call “Big Stuff” I’d call fixing the current problem. It’s kind of like a TV network moving a show with poor ratings out of the prime time slot to make way for something new. Eventually “Recommendations” will bore us and then what? Figure that out and you’ll be on the edge of “Big Stuff”. @Paul – I’m not sure that I believe that there’s a divorce between “solving problems” and “big stuff”. I think few innovations are created in the absence of a pain-point. And I also disagree that being boring is the opposite of being disruptive — in fact, I’d say the opposite — the destiny of any disruptive technology is to become boring as it becomes a part of the fabric of the technology landscape. Search is boring. It’s also essential. I’m not entirely convinced that this was to create a new feature set. There’s an interesting by-product of what’s happened here. 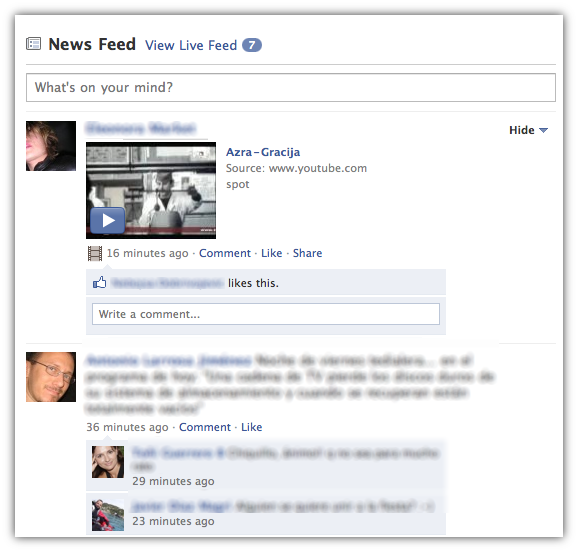 Most people have moved to the “Live Feed” because the “News Feed” is too limiting. This has caused everyone to see who everyone else is adding as their friend, and, with that, they’ve added them as well. It has created more bonds between people already on the site and hence creates a stronger desire to bring in friends who aren’t already on it as well. I don’t think they’ll see an enormous user spike out of this, but it’s a solid step towards ubiquity.